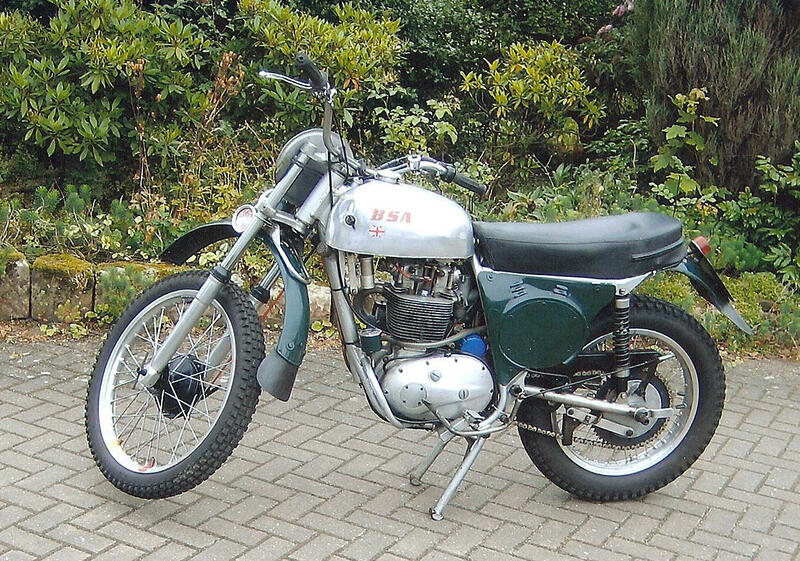 Bryan Cowshall’s accompanying (copy) letter states that this machine was ridden by him in the 1973 ISDT in Czechoslovakia and also in the 1971 and 1972 International Welsh and German Two-Day enduros. (In actual fact, the 1973 ISDT took place in the USA and the Czech event in 1972, but as Bryan was writing more than 20 years after the event the error is understandable). This Cheney-BSA is one of six machines commissioned by the Ministry of Defence, for whom Bryan Cowshall was working as a test driver at the time, for use by the British Army Vase ‘A’ Team in the ISDT and other international events. Bypassing ‘red tape’, master frame-maker and ex-ISDT gold-medallist Eric Cheney built the first bike in time for Bryan Cowshall to debut it at the National Enduro at Bordon. A win at the following week’s ISCA Enduro was sufficient to interest the MoD ‘top brass’ and the prototype machine (minus Cheney’s special moto-cross motor and rear wheel assembly) was accepted for evaluation together with a second rolling chassis. Those two machines were subsequently raced successfully by Bryan Cowshall and Army Champion, George Webb, resulting in the purchase of four more rolling chassis from Eric Cheney. To satisfy the civil servants responsible for funding the project, the frames were painted Army Green as the ISDT Team were supposedly riding military machines. Bryan Cowshall’s letter reveals that the frame stamping ‘MVEECY 5’ stands for ‘Military Vehicle Experimental Establishment CheneY number 5’. He further states that which rider rode which bike in the ISDT cannot be determined from the frame numbers, although he was able to identify this machine as his by virtue of an official seal marking carried over from his 1970 ISDT BSA, as well as certain other unique features. The engines used by the Army’s ISDT team were ‘works’ units prepared in the BSA Competitions Department and fitted with lightened and polished crankshafts and con-rods. A compression plate (with appropriately lengthened pushrods) was fitted together with enduro cams, bigger valves and a special exhaust system designed by Dr Gordon Blair of Queen’s University Belfast. The lubrication system was modified to include the primary drive in order to cool the high-output alternator, while the ignition system – specially developed by Lucas – was dual CDI with external coils mounted on either side of the front downtube. The alloy clutch basket fitted to the Cowshall bike was a personal ‘perk’ from the ‘Comp Shop’ and not fitted to the other machines. In the ISDT itself, Bryan Cowshall had his bike’s forks seize and lost a footrest on the first morning, but nevertheless managed to finish on time. Unfortunately Bryan, together with several other riders, was taken ill overnight and could not continue with the event. What happened to his machine subsequently is not known. The vendor acquired the Cowshall Cheney-BSA in 2001 and has used it only once, on that year’s ISDT retrospective event in Wales, covering 900 trouble-free miles in the week. He advises us that it has undergone light restoration, including new wheel rims, and that the original Lucas ignition has been replaced with a Boyer-Bransden system. (The original rims and ignition are included in the sale together with some special fork and clutch spares). Representing a rare opportunity to acquire a semi-works Cheney-BSA with authenticated ISDT history, the machine is offered with Swansea V5 and is expected to possess a fresh MoT / tax by time of sale. Bryan was my father, would love to own that bike! Thanks for dropping by Adrian it’s a shame you don’t. I well remember your father. He used to thrash the BSA round the MVEE test track to “iron out” snags on the ISDT bikes made for the army. I was the engineer responsible for army bikes and the testing of the ISDT bikes. A memorable moment was when Ken Heanes”? came to Chobham to “demo” the Cheney Triumph. “Do something spectacular then” I said. Without blinking an eyelid Ken did a “wheelie” the length of the hangar we were in. That was 1970. I had the pleasure of riding the odd evening with Brian at Bordon in ’72. I have photos somewhere of the Cheneys arriving at Bordon in June 72. My dad was heavily involved with the army effort around that time and I remember trips to the BSA factory in an army landrover a few times in the school holidays!